Enjoy four super sharp, professional, manual focus lenses that all pair well with Canon's extremely high megapixel 5Ds R DSLR, which lacks an optical low pass filter enabling the highest possible image detail. This camera produces files that are 8688 x 5792, making it particularly suitable for large-scale printing and extensive cropping. Each one of these lenses is among the highest quality that Zeiss produces, with exceptional clarity, increased contrast, and uncompromised sharpness. The lenses sport metal barrels and very smooth focusing rings. The Intelligent Viewfinder in this camera displays 100% of your composition in addition to your settings so that you never have to take your eye off your scene. Also, these lenses transition well into video applications thanks to their silent design and smooth aperture adjustments. The 5Ds R shoots 1080p video. This package is ideal for creating images meant for a large impact and is particularly well-suited to portraits, commercial work, landscape, and lifestyle photography, as well as video making. This package also allows you to experience a variety of Zeiss lenses for less than renting them all individually. 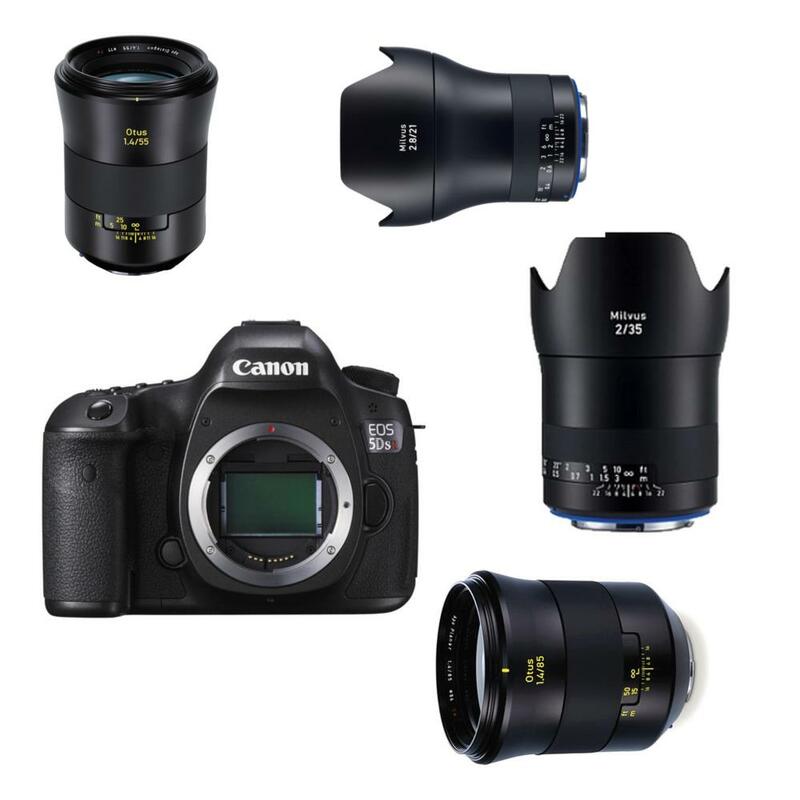 It is a great choice for clients, special assignments – both professional and personal – and for comparing focal lengths for educated purchasing decisions later. You will get to sample lenses from both the Milvus and the Otus lines of Zeiss. Great for: Landscapes, portraits, studio work, fine art, commercial work, and still life photography. • All lenses included in this particular package are manual focus only.